There is a holiday for everything and today is National Food on a Stick Day! 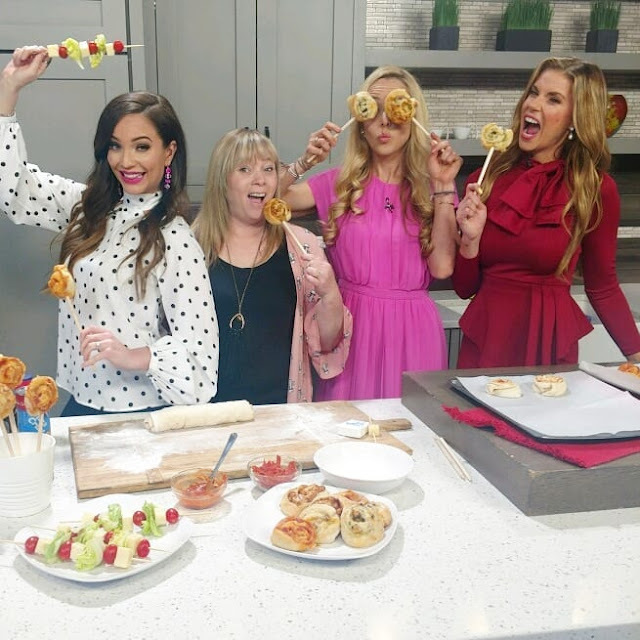 when the producers of KUTV's Fresh Living asked me to come up with something to celebrate this fun day, I knew it had to have our family's favorite pizza and salad! We love pizza of all kinds, but for our picky little ones it has to be fun. So, we decided to make them like we do our cinnamon rolls and add a stick. This recipe is so quick, simple, and easy. You can whip it up on the busiest of nights and feel like a hero! All you need to gather is a can or two of Pillsbury Refrigerated Pizza Dough, your favorite sauce, some cheese and chopped toppings. I love this dough. It is soft and super easy to work with and best of all, it tastes as good as my own homemade dough. Roll the dough out on a floured surface and square the edges. Spread your favorite sauce on lightly. If you use too much sauce or toppings they will cook out of the roll when baking. Spread to the outside short edge and leave a quarter inch naked on both long ends so your dough roll will stick together. Spread Marinara Sauce to outside short edge. Leave long edge naked. Lightly spread on cheese and toppings that have been chopped small. This is a key need so that you can cut the rolls and not loose any of the goodness. Add cheese and chopped toppings. Roll the dough towards you to make a big pizza dough log. Using waxed or unwaxed non-flavored dental floss to cut the rolls. Take a piece a couple of feet long and slide under the log. Lift up the ends of the floss, cross over and pull down. This "cuts" the dough into nice chunks. Roll lengthwise like a cinnamon roll. Squeeze long edge together. When you are done cutting your pieces, place them on a parchment lined tray and lightly press down on the rolls to flaten them out a little. Pinch the ends that may come loose in cutting, or tuck them under the roll. Cut 1.5" lengths with a unflavored dental floss. Place on parchment lined baking sheet. Bake at 400 degrees for 10 to 12 minutes until everything is bubbly and the dough is lightly golden brown. Let cool slightly before sticking the sticks in. Bake for 10 to 12 minutes at 400 degrees. Let cool slightly. The sticks I use for my rolls or pies on a stick I get in the hardware section of my local shop. I cut them to 10 inches and use a pencil sharpener to make a point on one end. This allows me to slide it into pastry perfectly. They can be washed with hot soapy water and used again and again. Stick wooden dowels into each roll. For the Salad on a Stick, I used iceberg lettuce, cherry tomatoes and chunks of mozzarella cheese. For these sticks I used wood skewers that you can get at any grocery store. Soak them in water for a few minutes and slide your fixings on. To serve, drizzle a little dressing on or have a dipping dressing on the side. These are so yummy and make eating salad so fun! Finish off dinner with Salad on a Stick. We made several different types of pizza rolls. One was a Chicken Bacon Alfredo which had Alfredo sauce, Chopped Rotisserie Chicken Breast, Fresh Parsley, Hormel Real Bacon Bits, Chopped Olives, and Mozzarella Cheese. Oh, man was it good! Our favorite though was the Chicken BBQ Pizza Roll which we used BBQ Sauce, Chopped Rotisserie Chicken Breast, Chopped Red Onion, Chopped Green Pepper and Mixed Cheddar and Mozzarella Cheese. The red onion was amazing in this pizza roll. Catch the segment on KUTV Fresh Living! So, whether you add a stick to these pizza rolls or eat them without, they are our favorite way to eat pizza now! You can catch the segment on KUTV Fresh Living. We hope you enjoy this crazy fun holiday and use this recipe for brunches, dinners, and late night snacks throughout the year! My babies are cover girls! 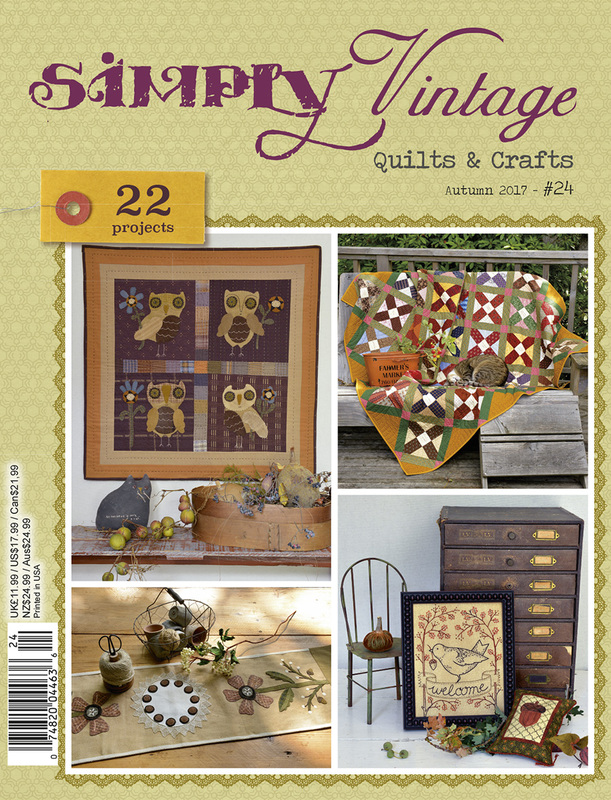 It is always fun to have your creations published, but I was super excited to see two of my hoop-art embroideries make the cover of the spring 2018 Simply Vintage Magazine published by Quilt Mania Inc. 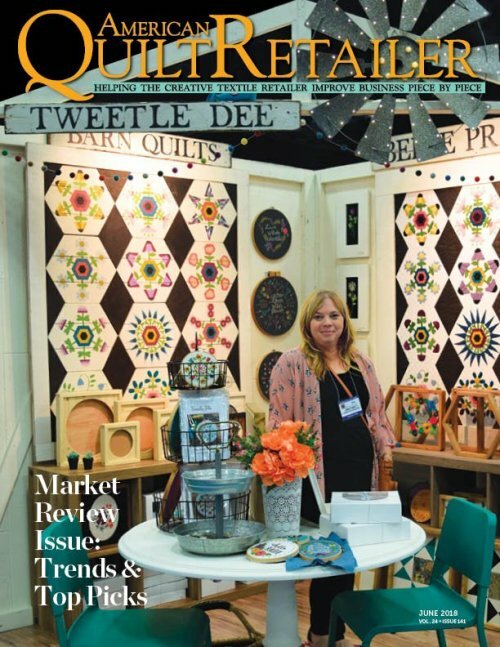 Inside the issue you will find the pattern and instructions for both She Was a Wildflower and Hello Beautiful, as well as many other amazing quilts and projects which are all inspired by everything vintage. 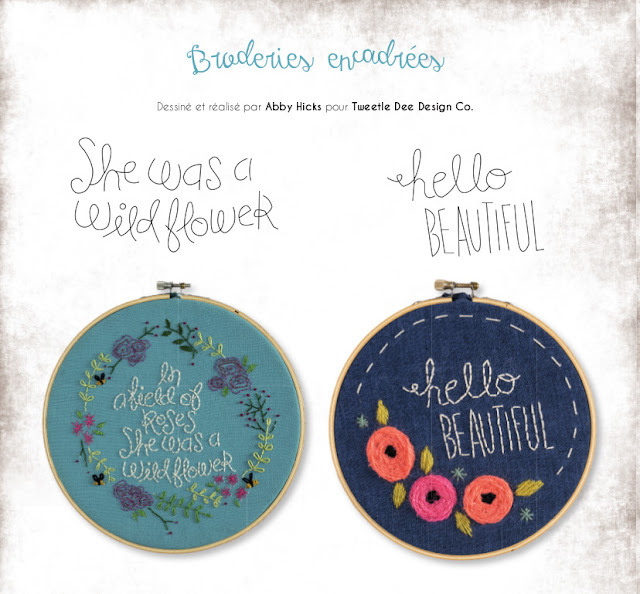 These two hoop-art patterns were designed for my daughters with a lot of love. If you are new to embroidery or would like to watch a video tutorial of the stitches used in these patterns you can find them on our Tweetle Dee You Tube Channel. 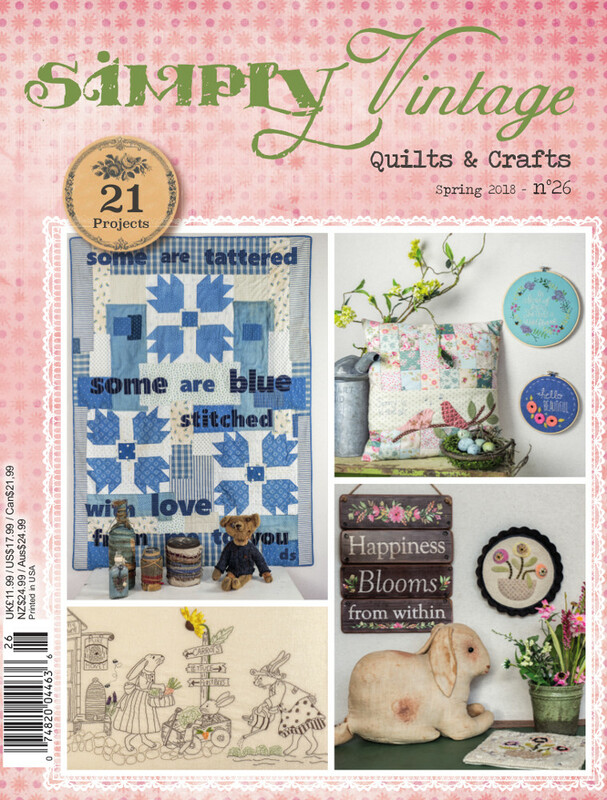 In addition to the pattern in Simply Vintage, you can purchase kits for both of these embroideries in My Shop. Each kit comes with the hoop, fabric, transfer pen, needle, floss and scissors as well as our Stitching Cheat Sheet. 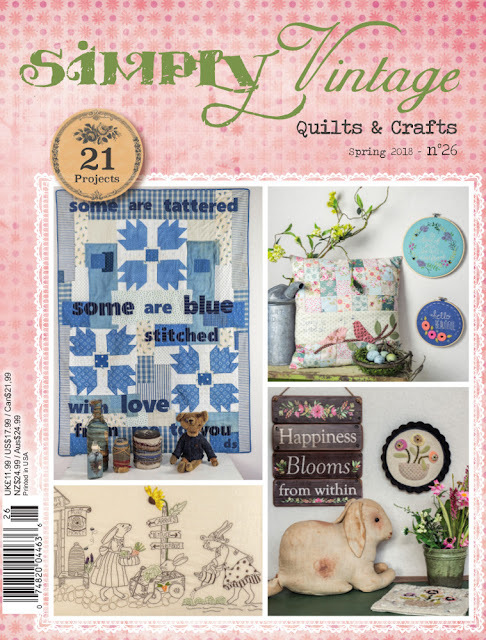 To get your copy of the Simply Vintage Spring 2018 Issue either visit your local quilt shop, Barns & Noble or click on the link. You will love this issue! Flowers are beginning to bloom, well sort of. I collected a basket full of felt flowers yesterday to add a little spring to our All Seasons Angel. I thought she needed a little color and so I'm sharing how to make these simple layered felt flowers today. They are perfect to make hair clips, brooches, or embellishment to anything. I am making a wreath to add a collection of them to. They are super simple to make and best of all, they don't fade with the season. I made three simple layered flowers. They look like a hydrangea to me and are the simplest felt flower. To make them, you need about an 10" square of wool felt in the color you want your layered flower. You can find the felt at most hobby or quilt shops. You will also need a 6" square piece of green felt, a few wool balls (optional) and a hot glue gun. How simple is that? To begin lay out the wool you want to make the flower with. Using a round lid (I used a spice lid) about 1 to 2" round, trace 6 to 8 circles. The larger the circle the bigger the flower will be, the smaller the circles, the smaller your flower will be. Pretty easy. If you want a wavy look to your petals, use your scissors to cut a wave around the outside of your circle. This is such a cute look when finished. Cut out the circles and heat up your glue gun. A low temp gun is best for this project. Squirt a small dot of glue in the inside center of your flower. Fold the circle in half with the glue inside and hold until set. To speed up the process you can set it under a book or cup edge to press until set. This allows you to glue all the pieces pretty quickly and not have to wait for each piece to set before making another. Oh, and don't mind my manicure...or lack of one. I am heading to get my nails done this weekend once our paint orders are out the door! After the glue is set in your half-circles. Repeat this process again folding your half-circle into a fouth-circle. Basically squirt the glue and fold in half again. Let set. Now you have your petals to make a layered flower! Take two of your folded petals and glue together at the outside points. Continue to add more petals around the first two to fill in and make your flower bloom! Let the hot glue dry. Fluff out the petals to get the look you want. Wool felt folds in mysterious ways and it is so fun to see how each flower it different. Now it's time for the leaves. Trace out the shape and length of the leaf you want onto the green felt. Cut inside the tracing line to eliminate the tracing line. I cut two petals for each leaf. One large and one smaller. I love the layered curved look which I will show you how to do now. The same as when you made your petals, you will squirt a dot of glue in the center bottom of your smaller leaf and fold in half. Hold in place until set. Next, wrap the larger leaf around the base of the smaller leaf and with two squirts of glue on either side fold and glue the larger leaf to the smaller leaf base. Let dry. Now you have a curved layered leaf that is ready to glue to the base or bottom of your flower. To figure where to glue, I set the flower down flat and look for where there is a gap that the leaf would fill in. Glue your leaves to the base of your flower. If you are going to use your Layered Felt Flower as a hair piece or brooch, cut out an additional circle of felt to glue onto the base of the flower and leaved to cover up the bottom. If you want a center to your flower, look for an opening in the folds and with a little itty bit of hot glue, adhere your wool balls in place. Let dry. There you go! Your first wool felt flower. It was super easy wasn't it? This is the same simple Layered Felt Flower that I made for the All Seasons Angel basket. You can pick up your angel on sale now and enjoy her all year. I'll probably add a few more felt flowers with some more tutorials throughout the year. I can't wait to make some more wildflowers to fill her basket come summer. Happy Spring! It seems like this first day of spring in the beginning of the year. Though I love the winter for it's white and bright, I really love spring and the renewal of everything. We have baby chicks, puppies due next month and our rhubarb is already sprouting! I'm sure we will have a few more flakes of white living on the mountain, but a new hope is here today. 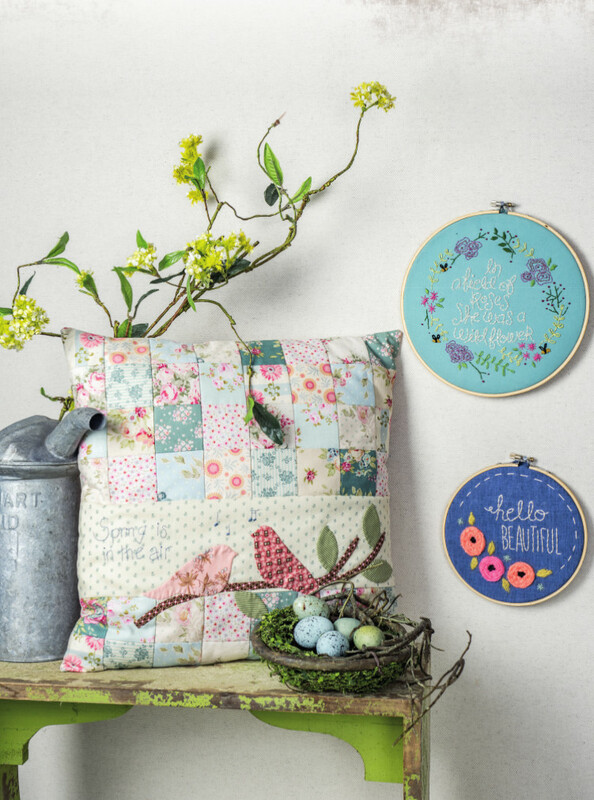 Today new to The Shop is our Spring Hoop Art Embroidery Kit. It is a simple, wreath with flowers popping up, buds blooming and a couple of bees taking a peek at all the new colors! Our kits come complete with everything you need to begin and finish your hoop art piece. We also offer three colors of the wood hoop, natural, stained, and black. We also link you to our You Tube Channel where you can watch all of the stitches used in this Spring Hoop Art. This embroidery is a part of a four part or seasonal group. The four hoops are so fun together with their bright colors and seasonal flowers. The kits are on sale through April! If you are itching to get stitching this year, this is a simple and fun set to begin on. We hope you are seeing a little more color in your part of the world and have a beautiful first day of spring! 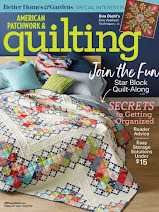 There are several classic quilt patterns that I have always loved and I am so happy to have patterned and painted one of my all time favorites, the Flying Swallow. Whether made with brights or lights it is a pattern that moves and turns. We have it in The Shop in four sizes with custom colors available. I have sent the pattern off to our graphics team to get the pattern completed for next week's workshops in Iowa and will add it to the shop as soon as we receive it. 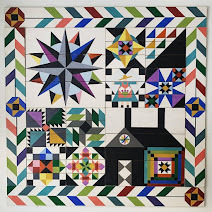 I am already painting my next Flying Swallow Barn Quilt in brights and can't wait to share it soon. Happy Monday and Daylight Savings! Are you feeling in pieces today like me? Daylight Savings always gets me a little "blocked up" as we adjust to the time change. I'm not complaining though about the longer nights! 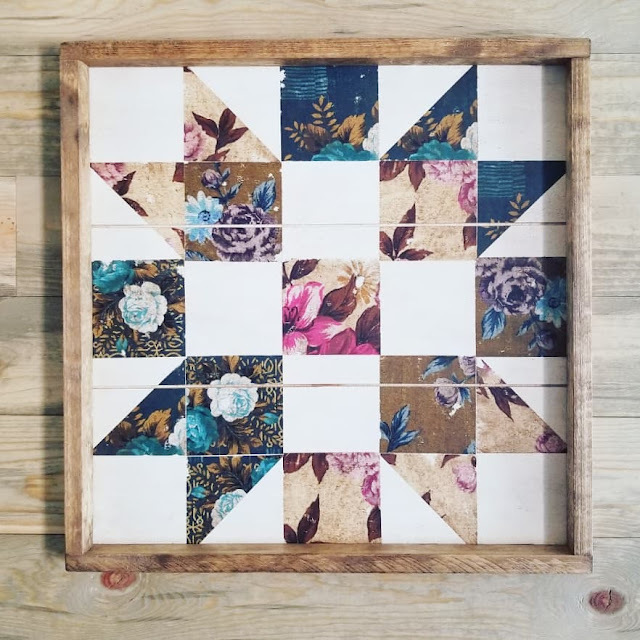 To make our Spring 25% Sale even more fun, all of our Barn Quilt Block Sets are marked down in addition to the Spring Sale pricing! So throw all of "your pieces" up in the air and put them back in amazing patterns today. Our Spring 25% sale ends this Sunday, so don't miss out on our last big sale before summer. I hope your Monday is fabulous and where ever you are the nights are getting longer, the grills are lit and a little spring is in the air. 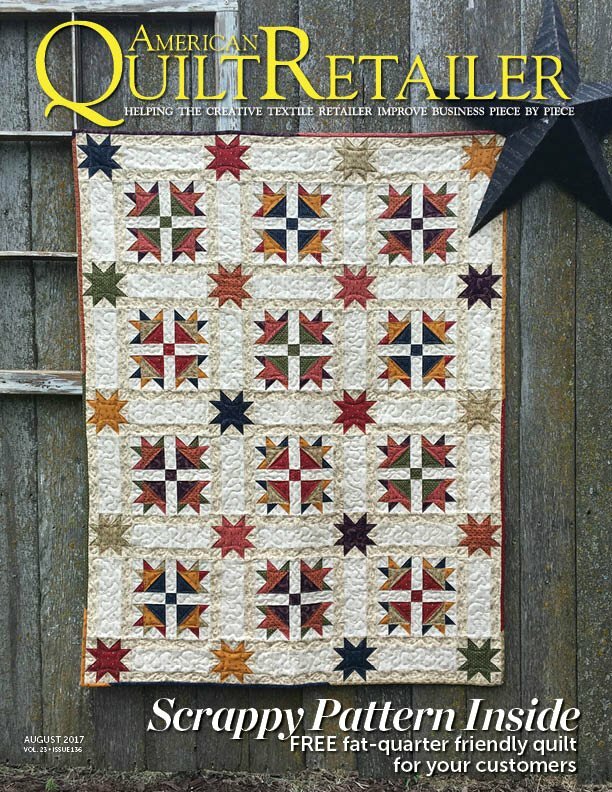 We are so excited to introduce our new Block of the Month Barn Quilt, the Belle Prairie Collection! The idea for this collection came from our visit last summer to Belle Prairie Nebraska which was the place my Grandmother's Great Grandfather homesteaded. The rolling hills waving in grain and wildflowers filled my soul and I wanted to create a collection that shared these prairie florals and their special meanings. The collection showcases twelve prairie flowers with their meanings, such as Queen Anne's Lace for Devoted Love and the lovely Coneflower which means Abundant Blessings. I thought I had a favorite, but after painting each one I honestly can say I love them all. Each month's flower is painted or kitted for a 16" planked hexagon! The shapes and colors are amazing together. We have several ways you can enjoy this Belle Prairie Collection. You can purchase the Block of the Month as monthly kits which will ship the first week of each month. The cost for the kit is $30.00 (details are on the shopping site.) 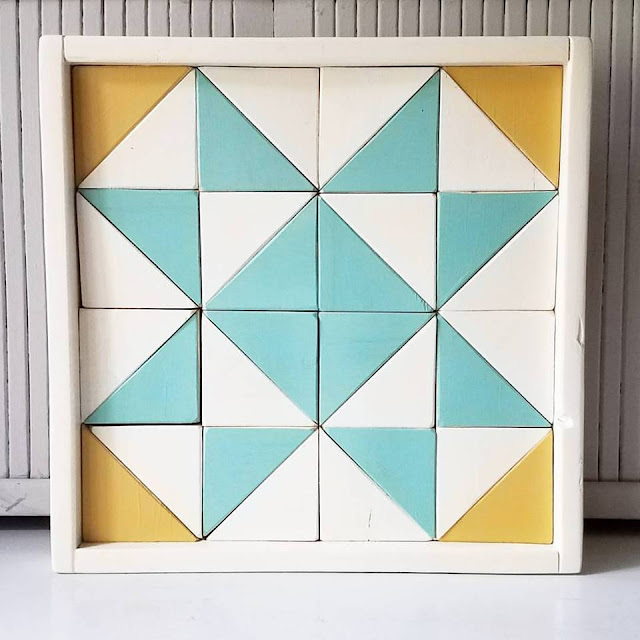 You can also purchase the painted collection as individual blocks or the entire set. 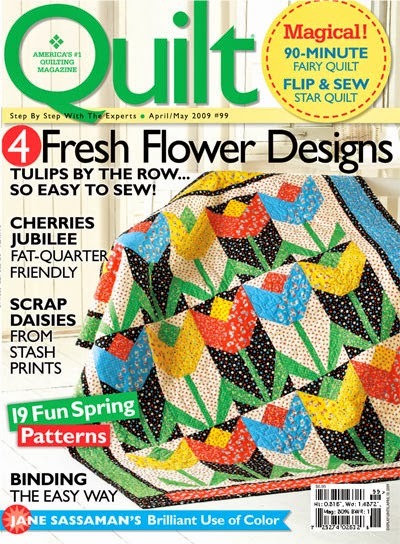 In the coming month's we will be adding our Belle Prairie Quilt to the collection, as well as many embroidery and wool projects with these adorable flowers. There are a few other Belle Prairie surprises which I will keep to my heart for now. I hope you love this collection as much as I do. It has been months and months in preparation and I can honestly say it is more than what I imagined. We are heading to Belle Prairie in a few weeks to photograph this beauty on the plains of Nebraska where it all came from. 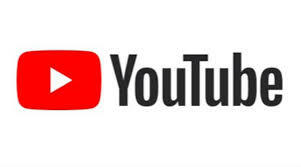 It will be a special moment for me and I can't wait to share it with you. For now though, we hope you will want to paint, sew, and stitch the florals of Belle along with us this year. Our newest ribbon embroidery sampler is here! You all know how much I love hand embroidery of all kinds, but I do have to say that my absolute favorite in the timeless art of ribbon embroidery. The texture and richness of color you get by hand stitching silk ribbons into florals and leaves is incomparable to any other embroidery. Just look at those woven roses and feathered leaves! The way a ribbon turns through a needle and fabric is so close to the arch in a real flower and honestly it is fairly simple to learn. 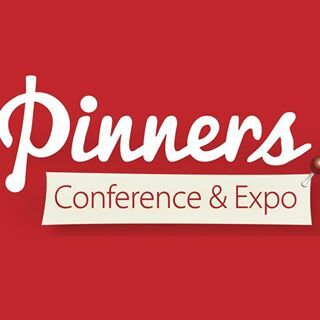 This Thursday I will be teaching two Beginning Ribbon Embroidery workshops at the USU Sewing and Textile Conference. I am so excited to share this art with educators who will then share it with their students. We will be sharing this workshop throughout this year in several places so keep an eye out for upcoming dates. 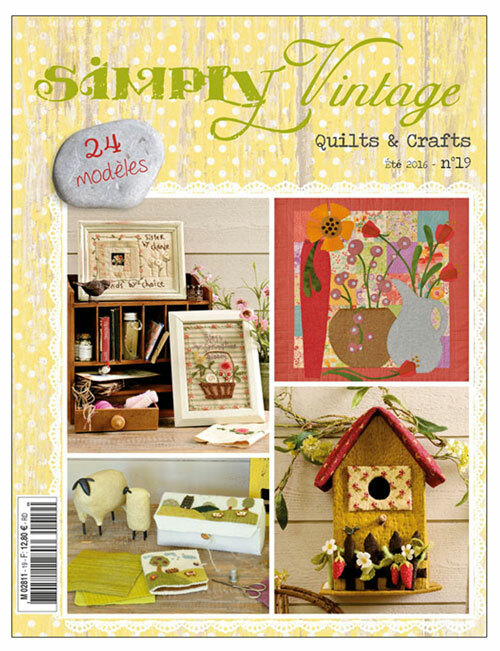 Until then, we have these finished Blooming Bee Samplers in Our Shop as well as kits for making one yourself. Each kit comes with everything you need to make one of these hoops as well as link to our online tutorials, so even if you can't make it to our hands on workshops, you can follow along and learn what you need to. 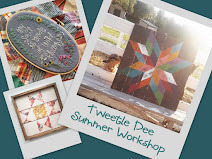 So, whether you want a Tweetle Dee Ribbon Embroidery Hoop Sampler or a DIY Kit we have you covered. Also, our Spring 25% Sale is still going through March 16th!!! Use code SPRING at checkout to get 25% off everything on our site. Happy stitching, painting, or whatever you like to do.